Award giving ceremony and Exhibition of Islamia Eye Hospital project Competition. competition for extension its building located at Farmgate, Dhaka. Hussain, President, IAB also spoke on the occasion. Rashid, Head of Dept. of Architecture at North South University, Ar. Ahsanul Hoque Khan, Deputy Chief Architect of Ministry of Works, Dr.
Fuad H Mallick,Head of Dept. of Architecture at BRAC University, Ar. Ar. Mamnoon Murshed Chowdhury acted as the Competition Coordinator. Sir Norman Foster often shows us the new dimensions in architecture achieved through outstanding technologies. It gives us a fresh enthusiasm to think beyond our conventional boundaries of thinking about ‘architecture what it can be’. 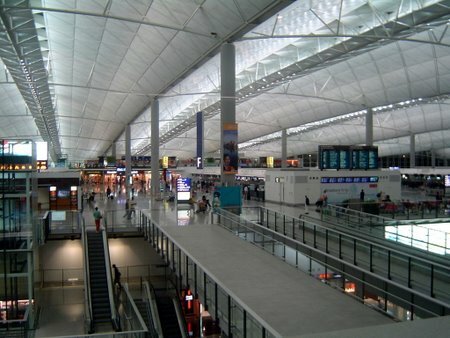 On July 6, 1998, Hong Kong opened its new international airport 16 miles out at sea. 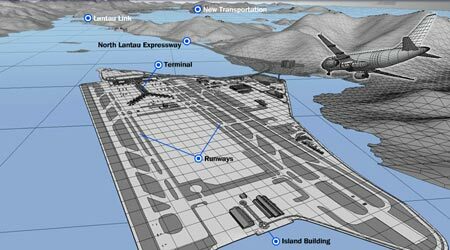 But first, engineers had to build not only the largest passenger terminal on earth, but a whole new island to hold the airport, and miles of tunnels, bridges and roadways to connect it to the mainland. The passenger terminal of this airport claims to be the world's largest enclosed space with 70 moving walkways stretching more than two miles, a pilotless electric train, 150 shops and a 1,100-room hotel. The airport’s twin runways, each more than 2.3 miles long, can support up to 49 flights per hour. The airport handles 45 million passengers a year nowadays, but that figure can be nearly doubled to 87 million! The flat island housing Hong Kong International Airport was actually two mountainous islands when construction began. But the mountains were pulverized and their rocks recycled to fill 1.5 miles of sea now connecting Chek Lap Kok and Lam Chau. A whole new six-lane expressway, utility and rail corridor hugs Lantau Island’s rugged coast. Like many of the new projects, it required extensive blasting and land-filling to build. So the visual story of planning and building this master piece work of architecture and engineering would worth to see for sure. AIUB (American International University, Bangladesh) Department of Architecture arranges the opportunity for you to experience the thrill in movie screen through the Documentary on ‘Extreme Engineering : Building Hong Kong’s Airport, Architect: Norman Foster’ directed by Jennifer Lorenz. Where: AIUB Auditorium (Campus – 1) [Lane opposite to Iqbal Center], H# 58/B, R# 21, Kamal Ataturk Avenue, Banani, Dhaka – 1213, Bangladesh. From 20th June to 20th July the London Festival of Architecture this Summer will be the biggest event of its kind in the world. It will involve all the major players in London’s environment including the Mayor, Design for London, local authorities, officers and members, and major developers, not to mention some of the world’s leading architects. In this mega event under the roof of London Tent, The Workspace Group Declared a competition which may become an opportunity for those who are innovative designers but are suffering from lack of exposure and even money to participate events like this! The Workspace Group Urbantine Project® emerged from the realization that there are limited opportunities for unrecognized architects to showcase their ideas three-dimensionally. Tent London’s fast architecture competition seeks to redress this issue, affording the winning entry the chance to put their design in front of the world's press and the industry’s most influential players during London Design Week at Tent London, Truman Brewery, Brick Lane. The winning entry will also have the opportunity to engage with an organisation, Workspace Group, which aims to provide progressive, appropriate, affordable and considered workspace accommodation for London’s creative industries. We want you to tackle the issue of rapid change in the 21st century workplace, such as the phenomenal rise in the use of digital technology and its impact on our work and office environments. Tremendous claims are made as to its possible effect on our communication, social interaction, mobility, productivity and creativity. £10K materials, construction & disassembly budget. Free venue for 4 days at Tent London, Truman Brewery, Brick Lane. Access to over 35,000 designers and architects during the London Design Festival. Visit the competition website for details and registration: CLICK HERE.